Yesterday was my husband and my 9 year wedding anniversary. We had a really great day. We went out to eat at a lovely Japanese Steakhouse. It was very nice. 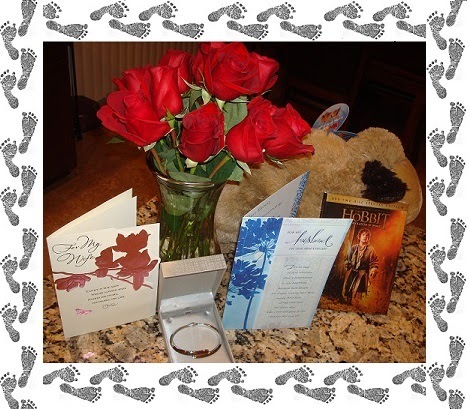 When we got home, we exchanged cards and he gave me roses, a beautiful bracelet, and a stuffed animal. We also got a movie to watch. I had a very good day and am so thrilled to be able to celebrate 9 years of wonderful marriage. In the midst of celebrating our 9th anniversary, there was the tug at my heart, that Faith was not here with us to celebrate. It is becoming more real day by day that she is gone, along with the fact that in every celebration/event, there will forever be a girl missing. While I am starting to get to a place where I am beginning to recognize some of myself again, I also realize that I am not recognizing my “old self”, but a completely new person; one who is broken, but blessed, lost, but loved, scarred, but sacred. As always, as I live my day to day life, Faith is, and will forever be with me. She is in my heart, soul, and mind in everything that I do. I love her more today than I did the day before, as I will continue to until I hold her again in Heaven. In my celebration of 9 years of marriage with my wonderful husband, we both know that somehow, Faith is here with us, saying “Happy Anniversary, Mom & Dad, I love you.” I know this for certain, because I know me and I know my husband. We have so much love for Faith, so I know she is celebrating our anniversary in Heaven and holding us in her heart as we hold her in ours.